Born out of her love for food and odd-looking cartoon characters, Uniman is her alter ego – a little quirky, a little timid, very flab-ulous and overall happy-go-lucky. You may think that you’ve seen enough characters that are designed based animals, but have you ever seen one that is inspired by… sea urchin gonads!? Now you have! This flabby, lumpy, and yellow blob of a life form is none other than Uniman! Uni, which is sea urchin in Japanese, is a popular Japanese delicacy. Covered with venomous spines on the outside, the treasure-sacks of a sea urchin is surprisingly buttery and yummy, although not everyone is able to stomach this exotic dish. 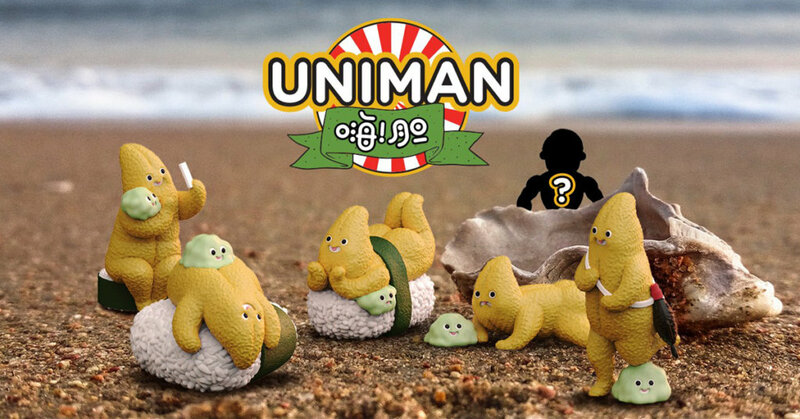 We foodies at Mighty Jaxx are big fans of this strange seafood, despite its exorbitant price tag, and are even bigger fans of Uniman! Turning a slice of sea urchin gonads into a strangely adorable character who wants to explore the world – who would ever think of that!? Exactly. Read Mighty Jaxx artist interview with Uniman’s creator, Sesameseedcat, and find out how the quirky yet lovable Uniman! was conceived HERE. Consisting of 5 Uniman! designs and 1 mystery chase. Find Sesameseedcat on Instagram and Facebook.